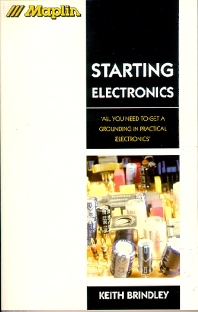 Starting Electronics is a nine-chapter introductory text to electronics based on feature articles previously published as magazine articles. The opening chapter provides an overview of the fundamentals of electronics. The succeeding chapters present details of some easy-to-do experiments and the current and voltage measurement. The remaining chapters cover some basic components of electronics, including capacitor, integrated circuit, oscillator, filter, diodes, and transistors. This book will prove useful to electronic constructors and students.